Google Search is going through makeover with better and more neater looking interface in the offering. On similar lines, other Google services are also getting makeover. Gmail users can also relish all new stylish looking interface while reading and sending emails. This new look is not enabled by default, users interested in new look can switch from default look to new look which is minimalistic yet stylish. 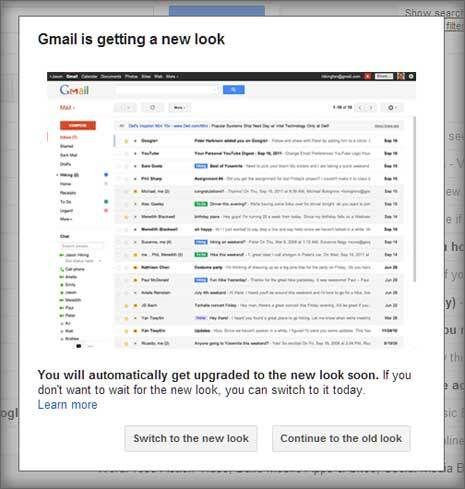 [Updated Details] Gmail is now rolling out option to activate and enable new look interface for inbox. New look is similar to preview theme (as seen below). According to Gmail team, the new look is based on 3 principles: focus, elasticity and effortlessness. 1. To enable new look Gmail, just login into your Gmail account. You should notice black pop-up box at bottom right which reads “Switch to the new look“. If you do not see it, wait for few days for Gmail to provide that option. 2. Once you click “Switch to the new look” box, you should see pop-up box with title “Gmail is getting a new look”. Click ‘Switch to new look’ button at the bottom. After refresh, you should see new look Gmail inbox. 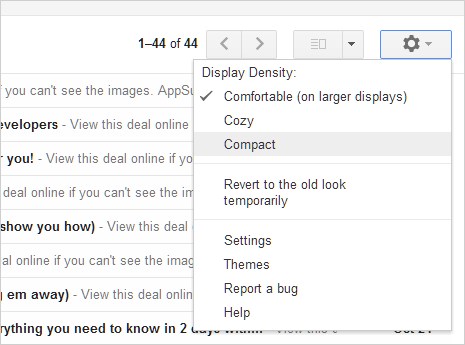 You will also get pop-up box explaining new elements in new Gmail look. Click on “Continue to the new look” button to proceed. 3. Once new look is activated, you can customize it further. Click on Settings icon at top right side and use either of options like display density (comfortable, cozy, compact), revert to old look, themes, settings and help. 4. 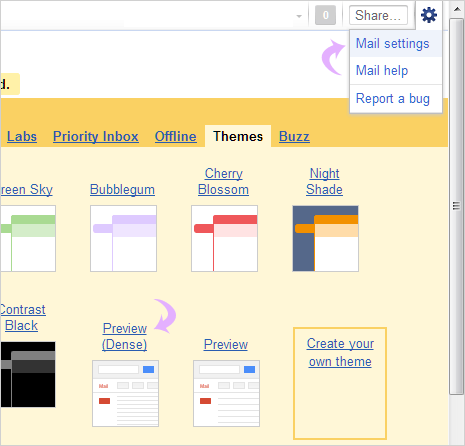 New look bring lot of changes to Gmail inbox interface. First notice-able change it options bar at top while viewing email message details. Now focus is more on icon buttons rather than text buttons (as seen in changes in screenshot below). Other elements of Gmail inbox like labels, chat, gadgets, reading your messages, search & filters, settings and contacts have also undergone makeover. Just explore and discover new things. 1. Login into your Gmail email account and click on Settings icon at top right. Then click Mail Settings option in the pop-down menu. 2. On the Mail Settings page, click Themes tab to open available theme look option. Check at the end of themes listing for Preview and Preview (dense) themes. 3. Click Preview or Preview (dense) option to see your Gmail inbox in all new look. Both theme options are almost similar with Preview (dense) showing content in more compact format with less vertical spacing. Whereas in default Preview look, there is lot of vertical space. This new look for sure look stylish, neater and cleaner – Gmail has ever had. Unfortunately, I hate the new Gmail look. I like the idea of consistency between different Google’s services, but I’d like to see something different. Lst but not least, the new Gmail look is completely unuseful and impractical. Spaces between different elements of GUI are too big and too few elements are visible on the screen at the same time. In my browser (FF3) it is the case for both the normal and “dense” look preview. Thus, one of the most important Gmail’s advantages has been dropped out. The new look is simply much less ergonomic than the previous one.